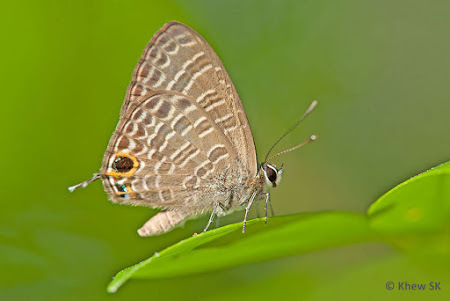 In my earlier update to the Singapore Checklist, we saw the inclusion of a Lycaenidae and a Hesperiidae added to the list after the species' life histories were recorded and the voucher specimens examined. 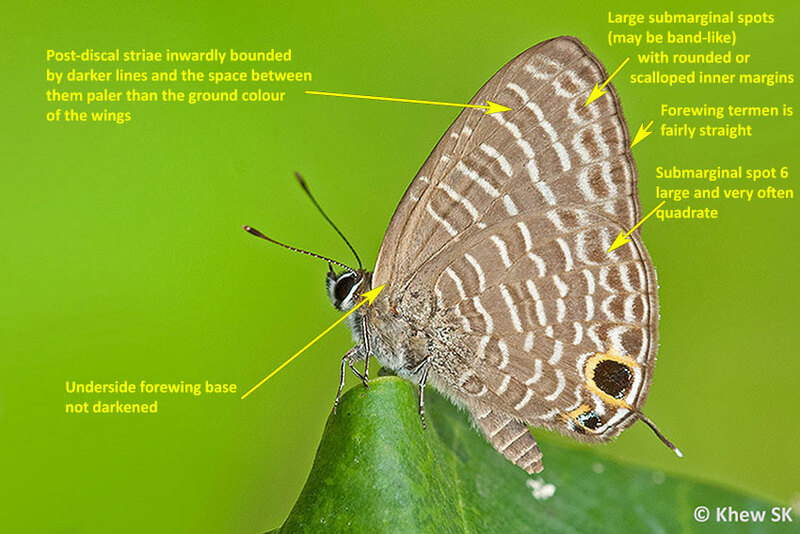 This week's article introduces two more species that are not easy to identify in the field without careful scrutiny of the physical features of the butterfly. The first species featured here is one of the Lycaenidae from the genus Nacaduba. This genus comprises several lookalike species known as the Fourline and Sixline Blues. A number of the species found in Singapore look very similar and only with careful examination of their diagnostic wing markings can one separate them. The fact that these species are also variable across different individuals and sexes can also prove challenging to identify them with a high level of confidence. 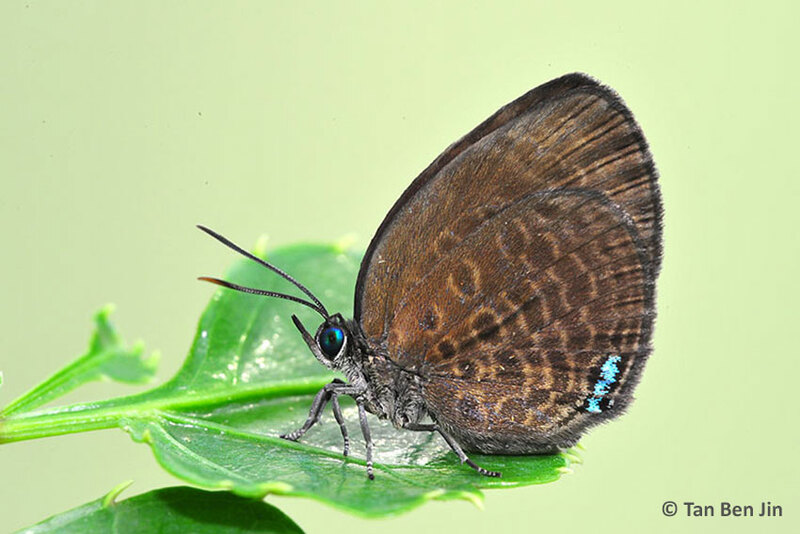 The scrutiny of many photos and specimens collected during official NParks surveys indicated that one species, the Transparent Sixline Blue (Nacaduba kurava nemana) is extant in Singapore. Over the years, this species had been mis-identifed as one of its two close cousins - the Opaque Sixline Blue and the Rounded Sixline Blue. Indeed, the species are so similarly marked that they may often be confused with each other, particularly with worn-out or tattered specimens shot in the field. With the help of ButterflyCircle forums' resident expert, Dr Seow TL, (and many discussions on the forums), we are now confident of the existence of the Transparent Sixline Blue. Besides the ID keys described in our references, Dr Seow has also added certain key characteristics that are consistent in this species. 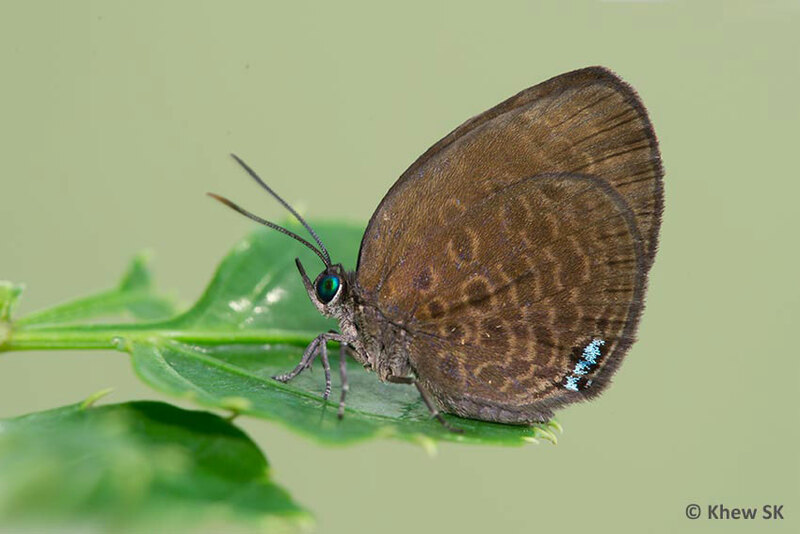 The Transparent Sixline Blue is described to have violet blue upperside in the male with the underside markings visible through the wings by transparency. The female upperside is pale shining blue with white patches beyond the forewing cell. The underside has the post-discal striae inwardly bounded by darker lines and the space between them paler than the ground colour of the wings. The termen of the forewing is fairly straight. Large submarginal spots (may be band-like) with rounded or scalloped inner margins; HW submarginal spot 6 large and very often quadrate (squarish). Underside forewing base not darkened. Females are more difficult to ID although the general features are applicable. 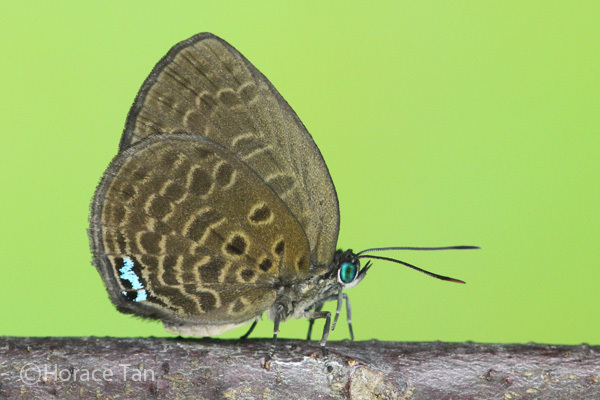 We record the Transparent Sixline Blue (Nacaduba kurava nemana) as species #321 in the Singapore Checklist. 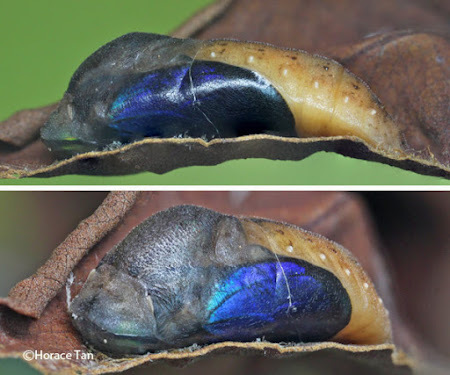 In the references, four other Nacaduba species - N. pendleburyi pendleburyi, N. hermus swatipa, N. subperusia lysa and N. russelli - all very similar looking species, should be further investigated and looked for in Singapore, as they have been recorded as extant by the early authors. The next species of interest comes from the frustratingly-difficult to identify genus, Arhopala. This genus, with over 80 recorded species in Malaysia and Singapore, often proves challenging to separate the individual species. New species are still being described when additional information becomes available. This genus would benefit greatly from DNA sequencing and a database should be collated when the opportunity arises. 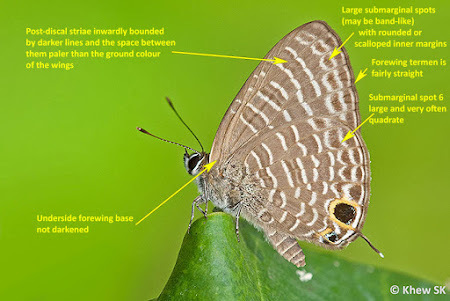 After ButterflyCircle member Tan Ben Jin discovered caterpillars of an Arhopala feeding on Lithocarpus bennetii in the nature reserves back in 2010, a long debate ensued and discussions on tracing the ID of the specimen initially proved futile. A later attempt at breeding the same species on the same plant by Horace Tan yielded further voucher specimens for examination. Even with specimens bred from the same host plant, the voucher specimens that resulted from breeding appeared to have differences between individuals that suggest the existence of more than one species! However, Dr Seow is fairly confident of the identity of the Mutal Oakblue (Arhopala muta maranda) for us to record the re-discovery of this species in Singapore. 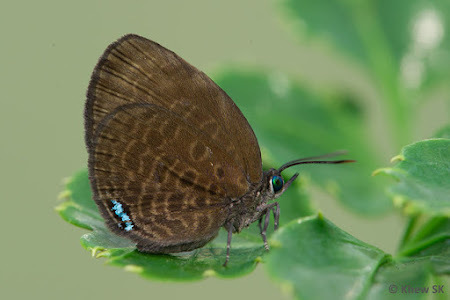 The Mutal Oakblue is a small butterfly of about 30mm wingspan and described as shining blue on the upperside, with the marginal borders increasing from 1.5 mm to about 2.0 mm at the apical area of the forewing. The hindwing is paler and a brighter blue contrasting with the forewing in a sidelight. The female is a shining blue with a purple tinge and broad black borders. The post-discal spots on the brown underside appear more squarish, giving it a banded appearance. The spot in space 2 of the forewing is out of line with the adjacent spots and moved towards the termen. The species is tailless. With the relatively conclusive evidence of voucher specimens of this species, we record the Mutal Oakblue (Arhopala muta maranda) as species #322 in the Singapore Checklist. Further investigations continue, and it is highly likely that more species from the genus Arhopala will turn up sooner or later, depending on the availability of life history documentation and actual voucher specimens for examination. In a forthcoming blog article, we will feature the addition of two more Hesperiidae to the Singapore Checklist after concluding early stages documentation and voucher specimens have confirmed the IDs of the skippers with a high level of confidence. Text by Khew SK : Photos by Sunny Chir, Foo Jit Leang, Khew SK, Tan Ben Jin and Horace Tan. Special thanks to Ben Jin for discovering the Arhopala and Horace Tan for his patience and effort in documenting the early stages of these species and to Dr TL Seow for his persistence in scrutinising the voucher specimens to identify the species with a high level of confidence, in particular the Arhopala muta maranda, which led to several dead-ends for some time.